From the heresy trial of Italian astronomer Galileo Galilei four centuries ago to the uproar over Charles Darwin’s theory of evolution, religion and science have often been seen as being in conflict. But are religious faith and the scientific enterprise really at odds with each other? 1 The least religiously observant Americans are most likely to perceive conflict between religion and science. 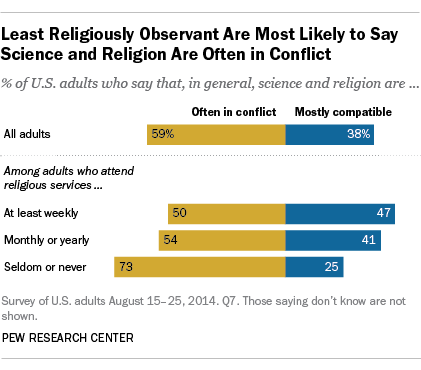 Some 73% of adults who seldom or never attend religious services say science and religion are often in conflict, while half of adults who attend religious services at least weekly say the same. 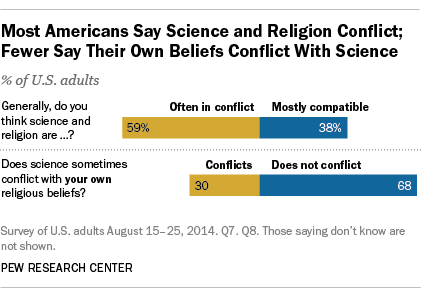 2Most American adults (68%) say there is no conflict between their personal religious beliefs and science. For the 30% who do see a conflict, the most common source of disagreement involves beliefs about evolution and the creation of the universe. Indeed, among those who say that science and their own religious beliefs are in conflict, 36% cite evolution and/or the creation of the universe as the primary source of the discord – more than any other answer to the open-ended question. About a third of adults (31%) say that humans did not evolve but have always existed in their present form; white evangelical Protestants (60%) are more likely than those in other major religious groups to hold this view. White evangelical Protestants also are more likely than others to say that there is not a scientific consensus on human evolution (49%). 4The public is closely divided about whether churches and other houses of worship should be involved in science policy debates, such as climate change. Half of U.S. adults say churches should express their views on scientific policy issues, while 46% say they should not do so. Most white evangelical Protestants (69%) and black Protestants (66%) say churches should express their views. But a majority (66%) of those who are unaffiliated with any religion disagree, saying that churches should keep out of such matters. Catholics, like the public as a whole, are divided on this question, with 45% saying churches should express their views on scientific policy issues and 49% saying they should not do so. 5 People’s religious differences do not play a central role in explaining their beliefs on a number of science-related topics – ranging from views about climate change to the safety of genetically modified foods. One exception is human genetic modification, where religious observance is tied to public opinion. 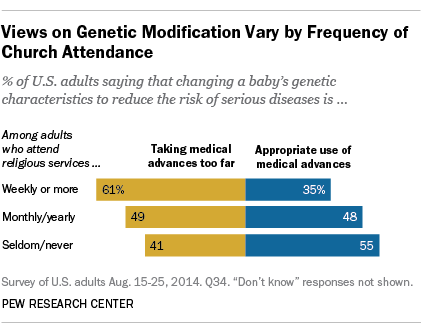 For example, 61% of U.S. adults who attend worship services at least weekly, regardless of their particular religious tradition, say genetic modification to reduce a baby’s risk of serious diseases would be “taking medical advances too far.” By comparison, among adults who seldom or never attend worship services, 41% say genetic modification for this purpose would be taking advances too far.